It is one of the oddities of musical history that, although Mozart spent a good many years as court composer to the Prince-Archbishop of Salzburg, he never completed a full-scale setting of the mass on a symphonic scale. His nearest approaches to such liturgical settings, the Mass in C minor and the Requiem, were both left as unfinished torsos (for different reasons). The large-scale treatments by Haydn and Beethoven, which might have spurred him into the provision of competitive versions, came after his death. There had, of course, been very substantial settings of the mass before his time—those by Biber and Bach the most prominent—but those scores had by Mozart’s day been consigned to the dusty cupboards of history. There simply does not seem to have been the demand for such massive scores at the time. This disc represents in some ways an attempt to fill the gap. The Missa brevis in B flat major K275 is supplemented by a selection of church sonatas and movements drawn from other contemporaneous liturgical settings, and concludes with the much later and well-known setting of the Ave verum corpus. Even so, the setting of the Credo at under four minutes is far too short to represent a symphonic structure on the scale of the other works from Vienna that were to follow with such effect within the next thirty years. 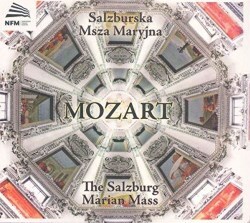 The booklet notes with this issue refer to the Salzburg Marian Mass as a “reconstruction” not of any specific occasion but as “an investigative canvas examining the possibilities.” It explains the presence of the later Ave verum corpus not as a part of this reconstruction, but as “a type of postlude as well as homage paid to the genius of Mozart”. Even with the additional material, however, it remains an incongruously short work, certainly nothing on the scale of Biber’s Missa Salisburgensis written a full century before. Nor it is anything like as grandiose as that predecessor, with single strings and chest organ supplemented by a trio of trombones which double the vocal lines. Oddly enough, a photograph in the booklet presumably deriving from the recording sessions shows an untenanted set of five timpani as well as miscellaneous percussion at the back; the combined strength of the choirs (including presumably the soloists) seems to total some thirty singers. Although it doubtless reflects the practice in Mozart’s day, the use of boy soloists on the treble lines leads to considerable problems with internal balance with the adults in concerted passages. There is a substantial booklet containing the complete Latin texts with translations into Polish and English, the usual biographies. A nine-page essay by Zbigniew Pilich (with English translation) spends a great deal of time on the history of music in Salzburg, but rather less on the music contained on the disc. It also gives an explanation for the exclusion of cellos from the instrumental ensemble, but is less convincing in its justification for the use of a solo double-bass when it admits that the Salzburg Kapelle in 1776 contained three such players. In any event, one suspects that the number of instrumentalists might have been expanded for special occasions. The violin lines in particular sound as if they could have benefited from reinforcement. Otherwise the playing is crisp, the singing well-tuned and confident. Nonetheless one is left with the feeling that the sense of occasion could have been more readily conveyed in a more “grandiose” performance. I cannot imagine that the sound here could have even begun to fill a cathedral acoustic of the scale of Salzburg’s. If performances in Mozart’s day were limited to the chamber forces heard on this disc, it is easy to understand the composer’s dissatisfaction with his employment by the Archbishop. All the same, this “reconstruction” is an oddly unbalanced work, with the total length of the mass movements (16:42) outweighed by the interpolated church sonatas (19:45), let alone the other choral sections. And the concluding performance of the Ave verum corpus, which despite the contentions of the booklet elsewhere was clearly written with a large body of strings (including cellos) in mind, lacks the sense of profundity it really demands.